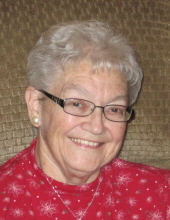 Judy Klinger, 78, of Pecatonica, IL died at 3:30 a.m., Wednesday, April 10, 2019 in Presence St. Joseph’s in Freeport, IL peacefully after a lengthy illness. Born January 28, 1941 in Rockford, IL, the daughter of Mr. and Mrs. A. Arnold and M. Elizabeth (Sloan) Marks. Graduated from Pecatonica High School, Class of 1959. Married Jerry J. Klinger in Pecatonica, IL on October 3, 1959. He passed away on January 3, 1999, after nearly 40 years of dairy farming together. She was a life-long member of First Congregational Church, Pecatonica, IL, member of Philathea and Lady Land Owners. Judy enjoyed playing Euchre and spending time and care giving for grandchildren and great grandchildren. The family would like to give a special thank you to Presence St. Joseph’s in Freeport for the loving and kind care over the past few months. Survivors include son Mark (Barb) Klinger; daughter Susan (Tom) Miller; grandchildren Nathan (fiancée Kari Lyphout) Miller, Amanda (Mark) Anderson, Rachel (fiancé Will Kissee) Klinger and Stephanie Klinger; great grandchildren Paisley and Payton Anderson and Wyatt and Jameson Kissee; sister-in-laws and brother-in-laws David Emerson, Sidney (Janet) Klinger, Wayne Klinger, Neil (Cindy) Klinger and Sandy Klinger; numerous nieces and nephews and many special friends. In 2013 God brought a Friend, Companion and Caregiver into Judy’s life, Richard Haschke and his family, Kim (Ray) Weyl, Kelly (Chris) Seaton, Rick (Kathy) Haschke and Al (Julie) Haschke families. She was preceded in death by her parents, husband, sisters Sara Emerson and Martha Cary-Harris and an infant brother. Funeral ceremonies will be held at 11:00 a.m., Monday, April 15, 2019 in First Congregational Church, 633 Reed Street, Pecatonica, IL with Pastor Duane Hoffman officiating. Burial will be in Twelve Mile Grove Cemetery, Pecatonica, IL. Visitation will be held at McCorkle Funeral Home-Pecatonica Chapel, 203 W Fifth Street, Pecatonica, IL from 6:00 to 8:00 p.m., Sunday, April 14. To send flowers or a remembrance gift to the family of Judy Klinger, please visit our Tribute Store. "Email Address" would like to share the life celebration of Judy Klinger. Click on the "link" to go to share a favorite memory or leave a condolence message for the family.